Very intense color. Very strong nose, dominated above all by fruity notes and a high mineral content. Cultivation methods add a touch of additional complexity. Strong palate and full-flavoured. The wine is structured, with very smooth tannins. The finish is long and savory. Saturated medium ruby. Inky cassis, black raspberry, graphite and pungent minerality on the very ripe nose. Dense, rich and silky, with a brooding inky minerality and an almost liqueur-like dark fruit sweetness leavened by a savory peppery element. This very ripe, deep and concentrated wine boasts wonderful lushness without any undue weight thanks to its sheer energy. 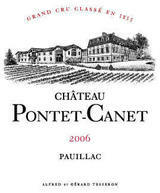 Like its neighbor Mouton-Rothschild, Pontet-Canet's 2006 conveys a powerful impression of soil character. Finishes with serious dusty tannins and superb lingering sweetness. Should be long-lived. Blackberry, currant and plum tart aromas lead to a full body, with a solid core of fruit, sweet fruit and silky tannins. Generous and round, with lovely richness for the vintage. Best after 2014. At this early stage in its development, this wine shows more structure than richness. The tannins are fully developed, dark and dense. The complexity is there, but the fruit and the elegance are still to come-and that suggests good aging potential.